Why we love it: There is no better time than spring to rock floral nail art. With Coachella season upon us, why not try a loud floral design like these red and yellow daisies? The slightly psychedelic print reminds us of music festivals past, but remains funky and fresh for 2019. We're especially digging the cute color choices and detailed black brushstrokes outlining the delicate designs, giving them extra pop and pizazz. To get the look: Use Essie Nail Polish, $9, in Geranium, Avant Garmet, Licorice, and Bikini So Teeny. Nail art is one of those photogenic beauty trends that we could look at all day long. 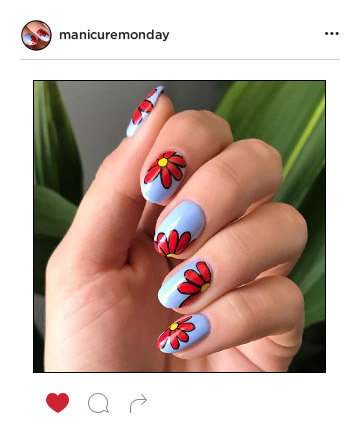 Somehow, scrolling through photos of nail art designs whipped up by nail art icons like Deborah Lippmann, Jin Soon and Paintbox is simply addictive — whether we plan to execute the nail design ideas or not. That's why we're bringing you our #ManicureMonday series — where we show you the simple nail art, endless nail design ideas and other ridiculously pretty nails that we're finding and loving. Keep clicking to get your weekly nail art inspiration fix.